The Knight is the ultimate martial artist of the chess board. It's tricky movement makes it a devastating weapon to an unsuspecting opponent. The piece resembles a familiar animal, but it should not be referred to as a "horse," or "horsie." The knight is the only piece that can jump over other pieces and moves in an tricky "L" shape. Its movement is one of the hardest for opponents to deal with because of its ability to attack in so many directions (at close range). To illustrate, look at the two diagrams below. You may notice that the black knight on e4 can reach eight squares (c3, c5, d2, d6, f2, f6, g3, g5) The black knight can reach these squares in a combination of "2 and 1" or "1 and 2" movements. This means 2 squares horizontally or vertically and then 1 square to form a right angle, or 1 square horizontally or vertically and then 2 squares to make a right angle. This movement makes the famous "L" shape. The knight has more power when placed toward the center of the board. 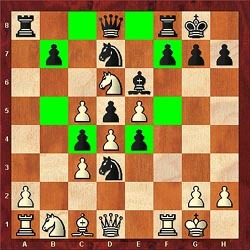 In Diagram #2 above, the black knight on e4 can reach eight squares while the white knight on h7 can only reach 3. Remember, "knight on the rim is grim." 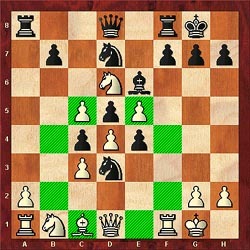 In terms of capturing, the black knight is attacking pawns on f2, g3, c5. It is also attacking the white queen on c3 and the white rook on d2 thus "forking" the two pieces. When capturing, the knight does not capture pieces in its path… only on the square on which it lands. 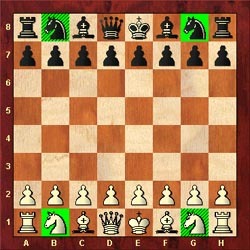 The "dream position" for the knight is the opponent's sixth rank supported by one or two pawns. 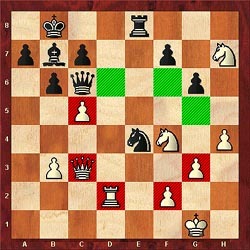 In the diagrams below, both knights have taken up dominating positions on the opponent's sixth rank… the white knight on d6 and the black knight on d3. 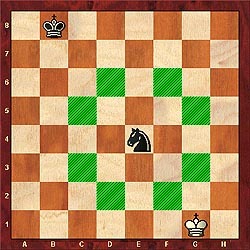 This position of the knight disrupts the flow of the enemy's pieces while attacking the maximum amount of squares.